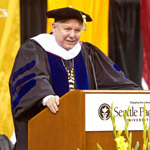 On June 9, 2012, SPU President Philip Eaton delivered the Commencement address at Seattle Pacific University’s 2012 Commencement. His Commencement address is being published here in three parts. I want to thank Dr. Congdon for these kind words of introduction. I also want to thank the faculty and the Board of Trustees for the huge honor of this new honorary degree. I am finally an official alum of SPU. I can now wear all my alumni gear, legally. So thank you. And thank you all for the support and encouragement and friendship you have given to Sharon and me throughout these beautiful years. We are profoundly grateful. And to all of the graduates this afternoon, I want you to know I am graduating with you today. This is it for me, my last time to speak to you or any audience as the president of Seattle Pacific University. We will step off this stage this afternoon, all of us, as new graduates of one of the leading Christian universities in the world, and we will step into an entirely new chapter for our lives. As I began to consider what I might say to you this afternoon, I thought about the Gettysburg Address. Did you know the Gettysburg Address was delivered in 1863 by the great orator Edward Everett? He spoke to 15,000 people that day, and he spoke for two hours! And nobody remembers a word he said. Actually, the president of the United States, Abraham Lincoln, was invited only to “offer a few appropriate remarks.” He spoke for three minutes, 272 words, and he shaped forever the deep American commitment that all men and women are created equal. So which speech would you like to hear from me this afternoon: my two-hour speech or my three-minute speech? I’m not sure about three minutes, but part of my theme today is to keep things brief when it comes to what really matters in life. As I prepare to step into a new chapter in my life, the biggest question for me right now is “Who am I?” It’s an identity question. And I suspect that’s the biggest question for you at this moment, isn’t it? No longer a student, now what? And I am asking, no longer the president, now what? You may be on your way to becoming a doctor, scientist, teacher, pastor, engineer, therapist, entrepreneur, theologian. Of course my advice is to be the best you can be for any one of these choices — but through it all, we’ve got to continue to ask what kind of person we want to be. That’s the identity question. Last week David Brooks, in his New York Times column, said that people in our culture today lack a “vocabulary of moral evaluation.” In other words, we lack a meaningful language of identity, apart from, or in addition to, the language of career? One of the towering figures of influence in my life was one of my undergraduate literature professors. His name was Dr. Clem Simpson. We never called him Clem, by the way. He was always Dr. Simpson. I just heard yesterday that no one calls Dr. Spina, Frank, ever. I know we would never have considered calling Dr. Simpson Clem Dawg, either. In any case, Dr. Simpson told a story about a moment in his life as a young faculty member at Wheaton College. He was feeling pushed to decide these very identity questions we are talking about: Who was he, apart from being a professor of literature? What did he really believe? And so as we think about identity this afternoon, my first advice is to follow Dr. Simpson: Keep it short. Maybe just three paragraphs. Take some time somewhere after this celebration, get some good coffee at Starbucks, and think about all you’ve read and studied, think about all you have heard from people along the way, your professors and friends and pastors, and then write something down. The question is one of identity: Just who are you as you walk off this stage?